After 2 months of fully raising my left arm from the successful decompression and microneurolysis of my Long Thoracic Nerve (see last blog), it became apparent that my A/C joint above my left shoulder was getting more sore along with the muscle/tendon beneath it. I also went through some episodes of mild subluxation of my Sternoclavicular (SC) Joint as documented by my chiropractor, Dr. Scott Sheldon. I describe it as my scapula was now working after the prior surgery and it was pulling back/downward and anchoring as it should and now it was in competition with the chronic tight pec minor opposing it. 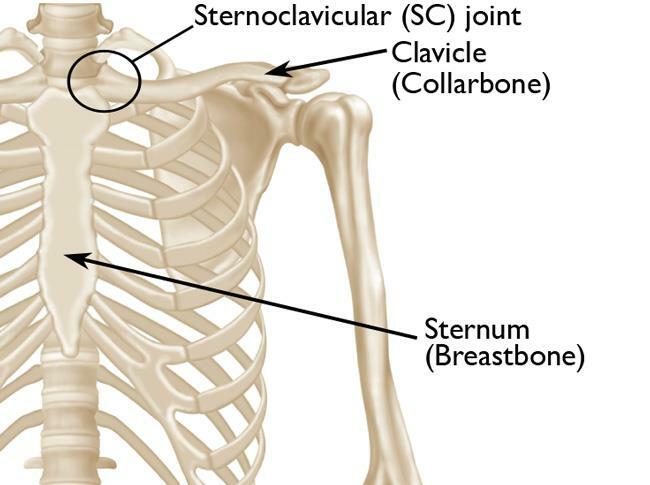 The pec minor attaches to the coracoid process of the scapula and I could now certainly feel the opposing forces going on especially when raising my arm. I also had increased burning nerve pain under my armpit that I did not have before my prior surgery. I describe it as all my nerve flow was opened up at the brachial plexus but now the neurovascular bundle that is passing under an even tighter pec minor muscle at its attachment to the coracoid is being further compressed. Before there was some slack when the scapula was winging. 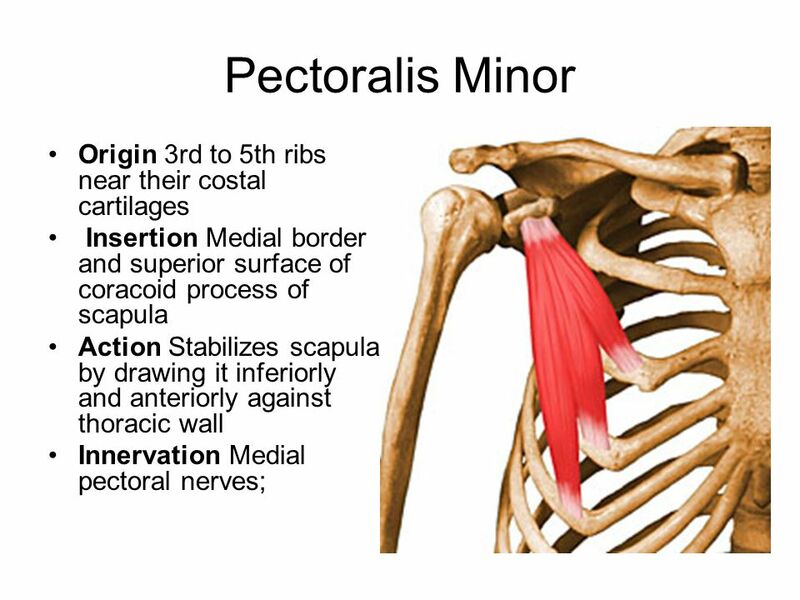 So I researched and studied about everything I could find on the Pectoralis Minor muscle and nerve issues. All during this time, I had 2 physical therapy appointments per week along with Medical Massage therapy trying to free up my pec minor muscle. Nothing was working. It simply was just too chronically short from years of bad body posture. The pec minor muscle also went unopposed for 5 years after my prior left shoulder surgery in 2011. Unopposed due to the scapular winging from the traction injury of my LTN nerve that occurred during that shoulder surgery while having a brachial plexus nerve block in anesthesia. 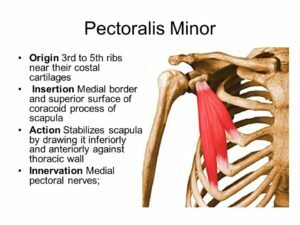 Here is one of my favorite articles on Pec Minor Muscle issues: The Pectoralis Minor, King of Compensation What I liked about the article was how it related to the Psoas and pelvic/gait compensations. Perfecting my gait has been my goal since my Sacroiliac Surgery in 2013. This article convinced me that upper body posture does have a correlation to the movement of our pelvis; because, when I’d have everything centered down below in my core, I’d come up against tight pecs when I wanted to fully stand upright and tall and externally rotate my shoulders. The article does much more justice than I can even begin to explain. I’m just saying it was a key piece of information for me in my journey. December 29th, 2016 – The day I was anxiously waiting for to have more relief in my shoulder and nerves of my arm. This was my surgical day for part 2 of Thoracic Outlet Syndrome. 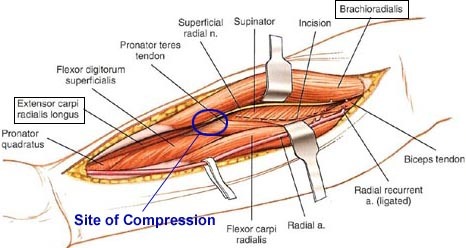 See my prior blog for part 1 dealing with my Brachial Plexus decompression. The surgery was doing a step cut lengthening of my pec minor muscle along with the short head of my biceps at the coracoid process along with complete decompression of the neurovascular bundle that passed underneath the tendons. The surgery was also augmented with Platelet Rich Plasma (PRP) injection into my A/C joint and plasma over surgical incision. 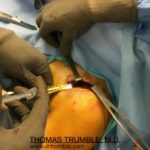 My trusted surgeon, Dr. Thomas Trumble, at Bellevue Bone & Joint Physicians, Bellevue, WA did my surgery at Eastside Surgical Center, Issaquah, WA. 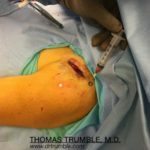 December 30th, 2016 – I saw my surgeon, Dr. Trumble, and his physical therapist to change the heavy surgical bandages to a smaller dressing. I was allowed to have motion of my arm such as the pendulum movement and work on ROM except no activation of my biceps for 3 weeks to allow healing of the tendon where it had been cut. If I wanted to bend up my left arm, I needed to assist it with my right hand. Believe me it was weak but not very painful at all. I could feel a lot less pressure over my A/C joint and certainly relieved that this surgery was behind me. I had received a new designed shoulder sling/immobilizer, the Breg Arc 2, that I found to be very comfortable. 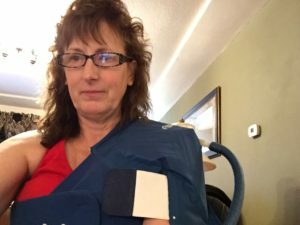 It was designed to be able to keep the shoulder more neutral and/or some external rotation to help keep my pec muscle opened up as compared to a sling that only brings the arm inward across the body. Compared to the many orthopedic surgeries I’ve had, I call this one a piece of cake in regards to post op pain, and I only needed about 36 hours of pain medication. But for those readers not familiar with all my other blogs, I will clarify and say that I have high pain tolerance and can avoid narcotics at all cost or only use them for a few days post every one of my various orthopedic surgeries. Actually I used a muscle relaxer instead which worked better for me. 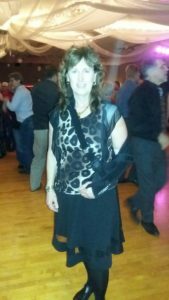 December 31st, 2016 – After driving back from Bellevue, WA my husband and I landed at the Moose Club to enjoy some dancing with our friends to celebrate the New Year. I was just 2 days since surgery and I absolutely felt great. I just kept my shoulder and arm close to my body and moved the rest of me. I am pictured in my older sling, not the new one as described above. 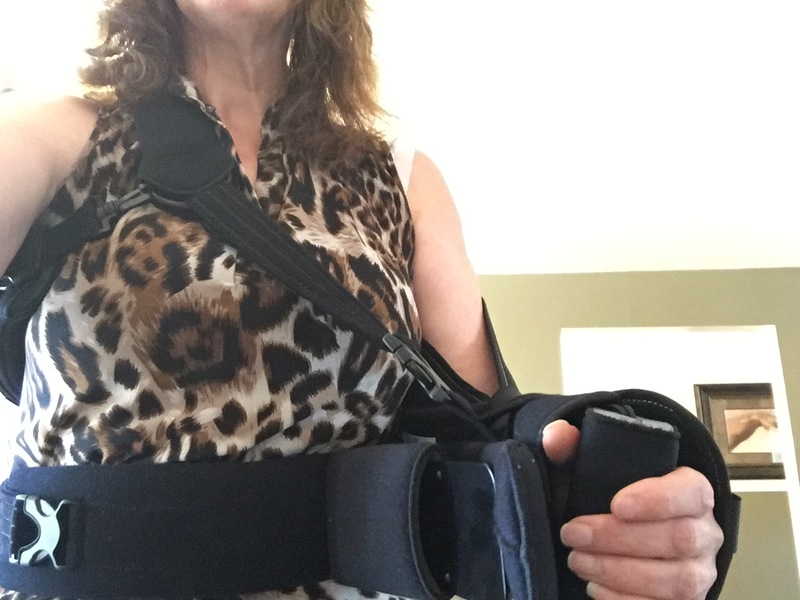 Here is a photo of my new and very comfortable Breg Sling. The New Year 2017 brought more months of physical therapy. 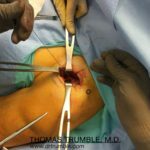 I was rehabbing well from this surgery; however, there were some details that needed to be addressed in my forearm. Even though the pain under my armpit diminished, I still was getting sensory burning pain, some tingling in the superficial radial nerve traveling to my my thumb. I had several rounds of ultrasound guided nerve hydrodissections into the radial tunnel, the radial groove, the superficial branch of radial nerve, the fascia around my pronator teres to free up compressed nerve flow. The ultrasound showed that my nerve was more swollen proximal to the site of compression. My osteopath, Dr.Lenoue, said I had the symptoms of Wartenberg Syndrome which I certainly concur with. I also feel like I still have some atrophy in between my thumb and first finger. I’ve been told along the way and through my countless hours of reading that when nerves are compressed upstream, such as mine were in my brachial and pec locations, other compression can happen along the course of the nerve downstream. This is absolutely true as I’ve seen my fascia compressing the nerves on the ultrasound. I’ve had many bouts with Radial Tunnel Nerve Pain too and not pain at the lateral epicondyle. 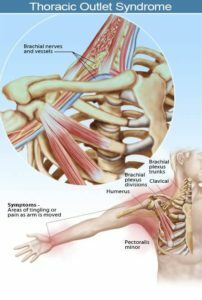 I have regular massage and I don’t hurt in my arm tendons nor am I sore at the epicondyle, this is deeper pain along the course of tight fascia tunnels that the nerve passes through. This ongoing problem has been discussed with my surgeon and possible future radial and/or superficial radial nerve decompression of the forearm may take place. 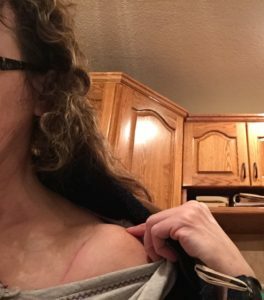 February 12th, 2017 – Here is a photo of my 6-week post op shoulder scar. As I write this blog now a full year after this pec minor surgery, I can still say it was a phenomenal minimally invasive surgery even though it was about a 2 inch cut to the inside of my front shoulder. 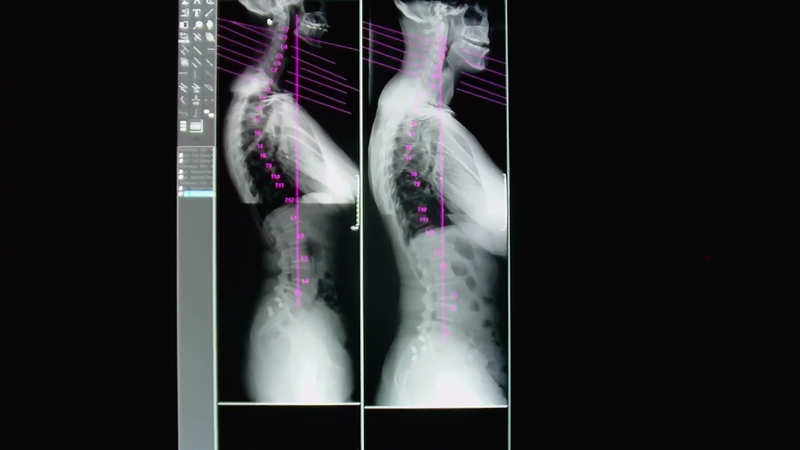 The positive biomechanical changes have been witnessed by my physical therapists, my chiropractor, my osteopath and of course my surgeon. I can set my shoulder girdle in neutral and do tricep strengthening, posterior RC strengthening pain free now which had been horrible and unsuccessful in my prior condition. I have full ROM in all directions. I’ve not had anymore subluxations of my SC joint, less tension on SCM up side of neck and still no more A/C joint pain. I can honestly say I love my left shoulder girdle complex even with the ongoing multi-directional instability of the humeral head within the joint capsule. I’m not sure at this point what I want to do for the instability as I’ve considered regenerative injections/prolotherapy or surgical capsular tightening. I had to leave off on this subject of my left arm for awhile as I had other surgical fish to fry during this past year of 2017. 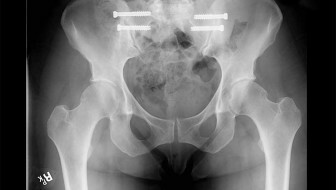 More blogs need to be written on Right Knee Meniscus Repair Surgery, Laparoscopic Uterine Suspension Surgery, Right Shoulder SLAP Repair with Pec Minor Lengthening. And now an upcoming Right Neck Brachial Plexus Decompression. In the end of the day its all good. I’m thankful and grateful to have a much better quality of life without prior levels of pain and biomechanical dysfunction. Dr. Trumble continues to go the extra mile with me in working to resolve all my remaining upper extremity issues. Any fellow patient needing the expertise of Dr. Trumble or his partner surgeon, Dr. Cameron Schick, don’t hesitate to drop my name and website to their office. The extra touch of joy comes when other patients see my blogs and write to me saying how much they identify with my stories. Paying it forward is the legacy I can leave in this life on earth. To God Be The Glory!! See and like my Facebook page.